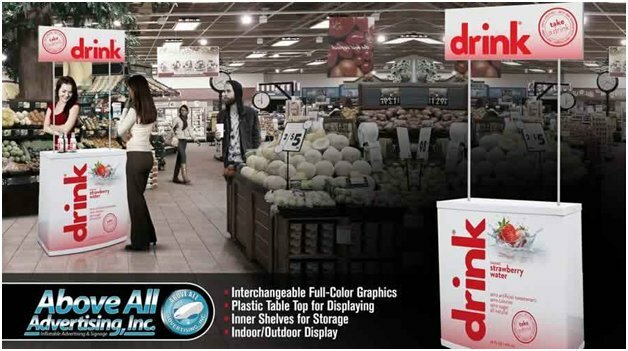 Indoor Advertising Displays. Creative Signs to use Indoors. Everyone knows that outdoor signage can be an effective way to bring attention to and promote your business. Your promotion shouldn't end outside of your business's front door. Expanding your signage to the great indoors can prove an invaluable sales tool. There are plenty of ways in which indoor signage can help increase sales and bolster your bottom line. In this post, we'll discuss 10 unique types of signs to use indoors. Reaching beyond traditional signage options, we'll discuss unique styles of signage. These choices make an impression and conveys information about your product to customers in an engaging way. Indoor signs will make an impression on customers and help boost business. 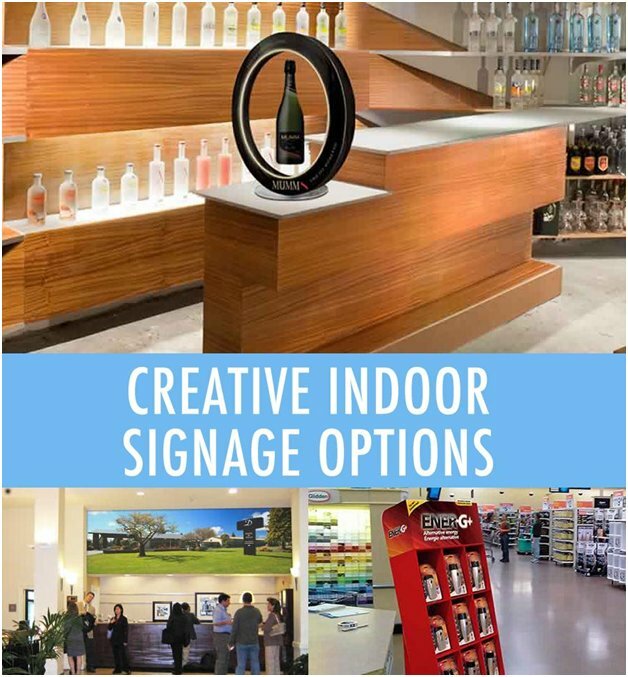 Regardless of the type of business you run, you could get some good use out of these creative and innovative indoor signs. These are just a taste of the offerings. You can browse the full indoor signage collection on the Above All Advertising website. We are living in the information age. Let your signage speak to your tech-savvy customers. 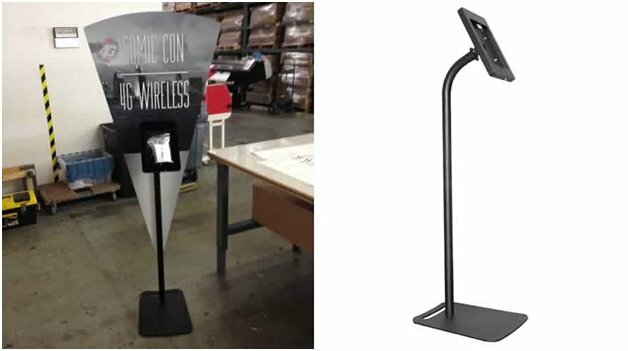 An iPad holder acts as a unique type of interactive sign for your business. Showcase an announcement on the holder in the attractive Viper-V display. Easy to set up, the iPad Holder can be programmed to educate customers about aspects of your business. The iPad Holder can provide interactive services or information. Therefore, no matter what type of content you choose to offer, it will attract attention. Did you know that sealed inflatables are proven to stimulate impulse purchases? They add appeal like no other type of point of sale display. Inflatables bring attention to the item you are promoting. It's like taking the eye-catching power of an outdoor advertising inflatable, and shrinking it to a size for indoors. An inflatable replica will command attention like nothing else. Carpet graphics. Don't let customers walk on by! 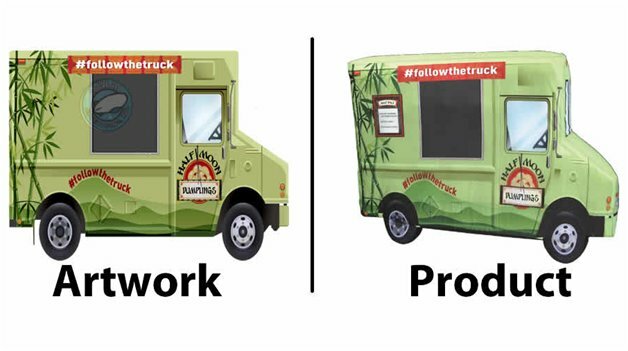 Create promotional artwork that stops them in their tracks. By putting a custom image a printable carpet, you'll catch the eye of customers. This creative style of signage is engaging. Create a carpet in any number of different colors and custom shapes. You can create something really unique, or create a wall-to-wall option for your business. The sky's the limit! Think podiums are only for airport customer service and political candidates? An event podium with a strong display graphic sends a message of authority. Have employees handing out samples or brochures. Additionally, it's a cost effective way to draw customers right to you. Easy to create using a large format print adhered to the podium. As a result, it looks super professional and very functional. Finally, use the podium to highlight a particular product. The rolling snap frame is a fantastic solution at an affordable price. You can easily change the display and roll the base out to various locations in your business for maximum impact. This slim, easy to display format, is dual-sided. Therefore, you can display multiple graphics in one display format! Are you looking for a temporary display that doesn't have a huge footprint? A recyclable display may be just the ticket. Corrugated cardboard displays emphasize your commitment to the environment They can be customized to fit any number of different products. 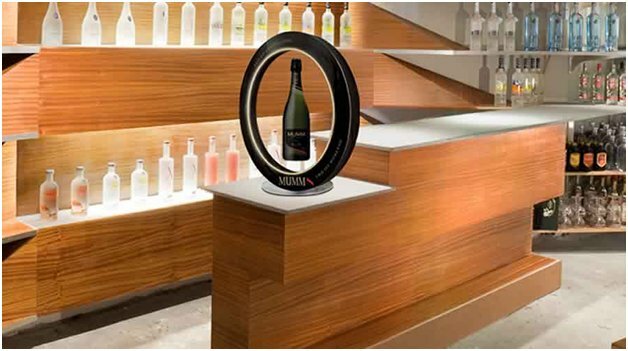 Such as, a free-standing display near registers which customers respect and gravitate toward. 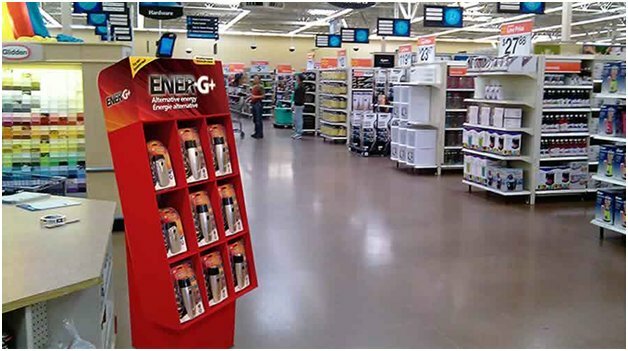 You're looking for an end cap display, Above All Advertising can help you. Your success is our business!. 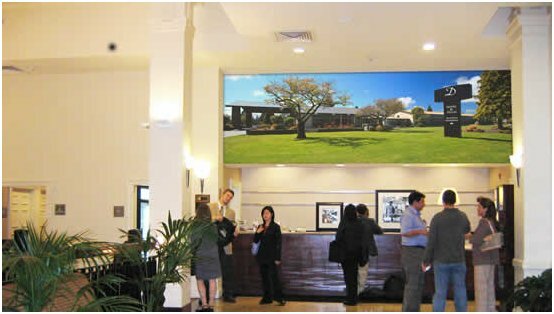 A wall mural makes a huge impact in your company space. They are created using state of the art UV inks. Murals are printed on a variety of different surfaces, and a huge array of sizes. Wall murals are eye catching and convey a professional air for your business. 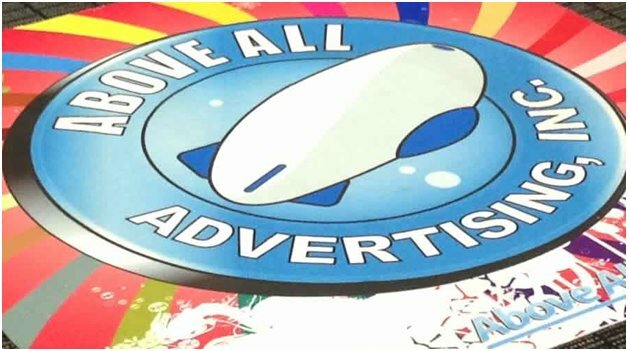 Promote your business in a big, splashy, attention-grabbing way. Whether it's on a wall in a retail store, in a public space such as a mall or business park. Display walls are like a movable wall mural. Impressive to behold, display walls are hugely popular for promoting businesses because of their versatility. Whether it's a curved display wall or a collapsible display wall, display walls are a great option for indoor signage. A table throw is simple but effective. 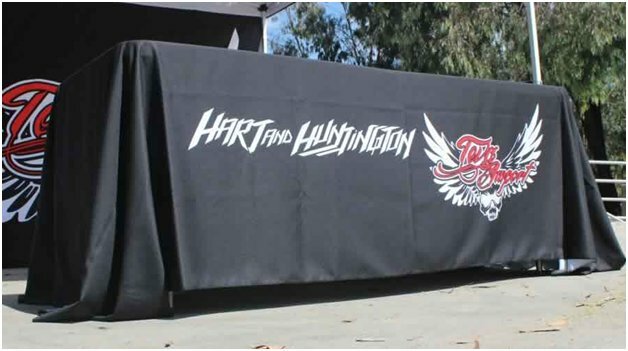 A table throw is a high quality tablecloth printed with professional graphics. It is functional and makes any table a selling surface. Designed to fit snugly over tables with no pins or clips needed. A table throw is a professional way to showcase your business. A table throw makes your display more beautiful. 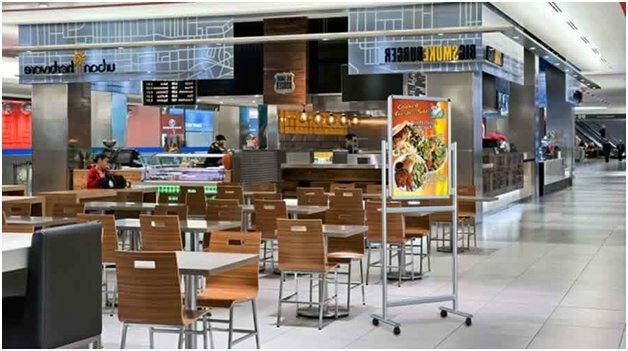 Similarly, you should look into our Table Talker product for restaurant advertising. 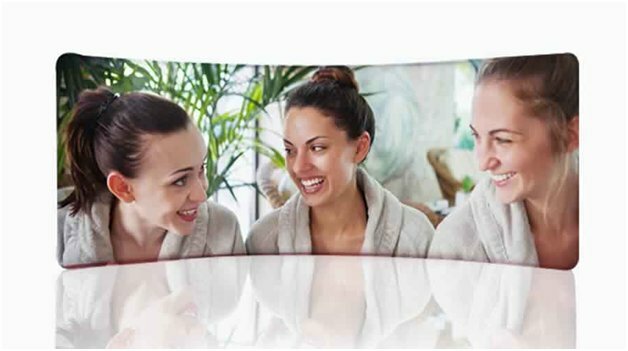 Create customers with a magnetic floating display. This futuristic technology defies gravity! Magnets, how do they work? Place objects inside the magnetic field. Spotlighting your advertising with LED lights. Additionally, the sign has a rotating option. Think outside of the advertising box with one of these unique signs to use indoors. Don't let outdoors be where all of your flash is. Keep customers fascinated once they enter your place of business. Use these indoor signs for your next indoor trade show or event.